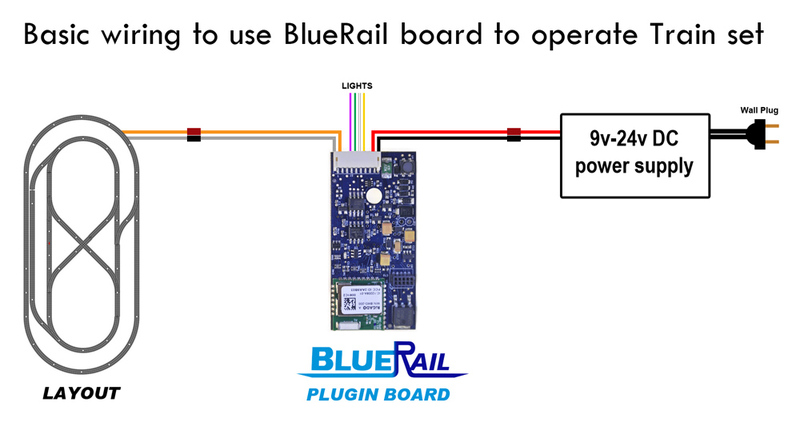 You can use a BlueRail board to control a DC train layout and up to 4 lights or accessories from your smart device. Use the diagrams below to see how to easily modify a 9 wire harness and connect a power supply. This is a great simple solution for HO, N or even Z train sets. You cannot control separate trains independently, but you can control either a single train or multiple locos as a consist. Note: to simplify the diagram, the colored wires on the 9-pin plug in these diagrams are not in the proper order. Please use the wire color to make your connections. 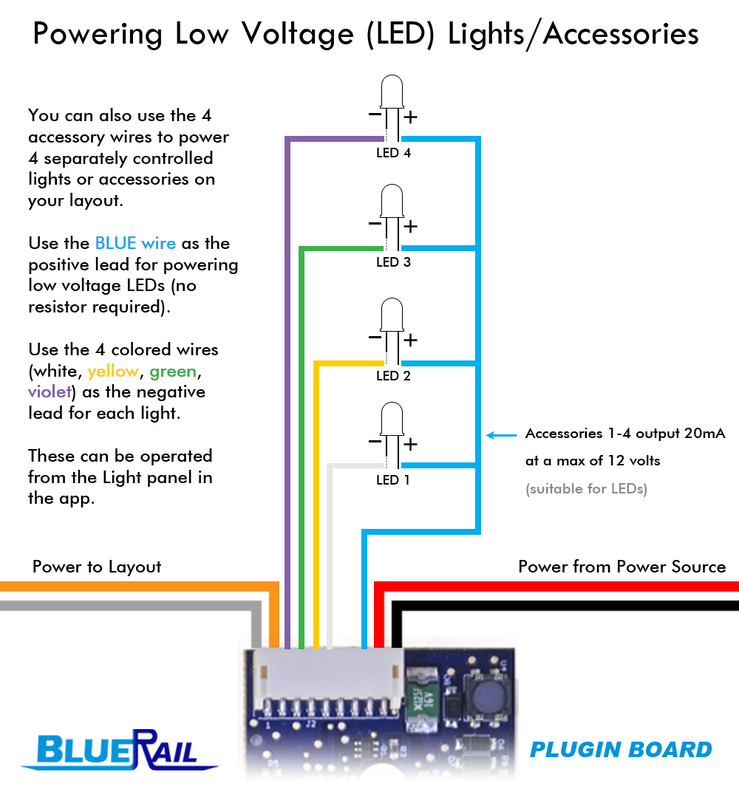 The diagram below shows how to power up to 4 low voltage LED lights on your layout. These can be independently controlled from your smart device in the “Light Panel”. BACK-EMF NOTE: If you plan on using multiple BlueRail boards to control different blocks on your layout, you will need to turn off back-EMF in each board. This is accomplished by going into the “Settings” screen in the app for each board, and toggling on the “Advanced Tuning” panel. Then, using the “Tuning Fork” button (now accessible in the Train Control screen) set the following three settings to a value of “0”: Proportional, Integral, and Differential. With all 3 PID values set to “0” back-EMF will be turned off. If you do not turn back-EMF off, you may find that your locos slow down briefly as they enter each new block. For the Bachmann Trolley, N scale trains and some other conventional locos you may achieve improved slow speed performance by adjusting the “Differential” value in the Advanced Tunings to “0” (instead of the default of “.235”). You’ll find this in the board “Settings” screen by clicking the little cog on the train control screen.